prohibit any teacher in a public school system of this state from helping students understand, analyze, critique, and review in an objective manner the scientific strengths and scientific weaknesses of existing scientific theories covered in the course being taught. As I understand it, this would allow any teacher at any time to argue against any scientific theory that they don’t agree with. Anything will go as long as they don’t explicitly say that their motivation is based on a “religious or non-religious doctrine.” Flat-earthers, HIV-deniers, and intelligent design proponents will be fair game in Tennessee schools. "Evolution may not be controversial in the scientific community, but may be in our greater community," bill sponsor Sen. Bo Watson, R-Hixson, said. Here is where the problem lies. The fundamentals of history should be decided by historians, math decided by mathematicians, and science by scientists. As long as the information is accurate, it should be taught truthfully. As Richard Feynman said: “Reality must take precedence over public relations.” This bill is a step backwards in the progress of humanity. On December 20th, 2005, Judge John E. Jones III, ruled that it was unconstitutional to read a statement that discredits evolutionary theory and barred the teaching of intelligent design there. This was the first, but probably not last, trial that involved the teaching of intelligent design as an alternative to evolution. Its hard to believe that it has only been 5 years since the details and motives of the Intelligent Design (ID) movement were brought out to the public in a public trial. We learned from staunch ID supporter Michael Behe that there are no peer reviewed published articles supporting ID. We learned how the Discovery Institute’s”wedge document” essentially points to the idea that ID was brought up as a way to replace the scientific method with “a science consonant with Christian and theistic convictions” We also saw how the book in question, Of Pandas and People, had earlier versions where they simply replaced the word “creation” with “intelligent design.” Of course there was more damming evidence against the ID proponents in the trial, but these three facts alone provide sufficient evidence that intelligent design is not science and should never be taught in the classroom. Since it has been so long since I last wrote a blog post, I thought that I ease back into blogging by attacking the lowest of the low hanging fruit from the Discovery Institute. Namely, the argument that Intelligent Design (ID) is real science. This is not a prediction. Life has already been seen to have “intricate patterns that perform specific functions.” In fact, isn’t the complexity of life what made people believe ID in the first place? It is rare to find any facet of an organism that doesn’t already have a precursor, let alone “large amounts of novel information.” The prediction of ID should state that there will only be the instant appearance of new structures. Any evidence for a slow, gradual development of a structure would refute ID and prove evolution. For example, you might see a fully formed tetrapod without any precursors if ID was true. However, we see in the fossil record myriad examples of transitional forms from fish to tetrapod (Tiktaalik, Panderichthys, etc.). This prediction seems odd to me. Convergence is a prediction of evolution. Take for example the convergence of the ability to fly. Evolution would predict that different organisms would gain the ability to fly, but they would achieve this ability by slightly different methods. Luskin is predicting that structures would be re-used by different organisms. Why do all wings look so different? Does a fly’s wing resemble a bird’s or a bat’s? Not at all. 4) “Much?” Luskin should have said “all.” if we are to believe in intelligent design. Why waste even a single nucleotide if you were to design an organism’s DNA? This sort of ambiguity is what makes these predictions worthless. I think it is clear to see that the predictions put forth by Luskin are basically worthless for providing support that ID is real science. What do you expect when you can give the “designer” any attribute, power, or foresight that you desire? Great news! Michigan State University has been awarded $25 million by the NSF to create a Science and Technology center to study evolution in action. This center will utilize resources from many other universities and involve 30 researchers. I am really glad to see that the NSF is willing to spend its money on such an important issue. The focus of the center is on evolution in action, an area of evolutionary biology that has not really been addressed in any large scale effort. Many of the missing details in evolution will be answered at this center. Having answers to these questions will both further our understanding of life and how it changes over time, but it will also address criticisms brought by people who doubt the theory. 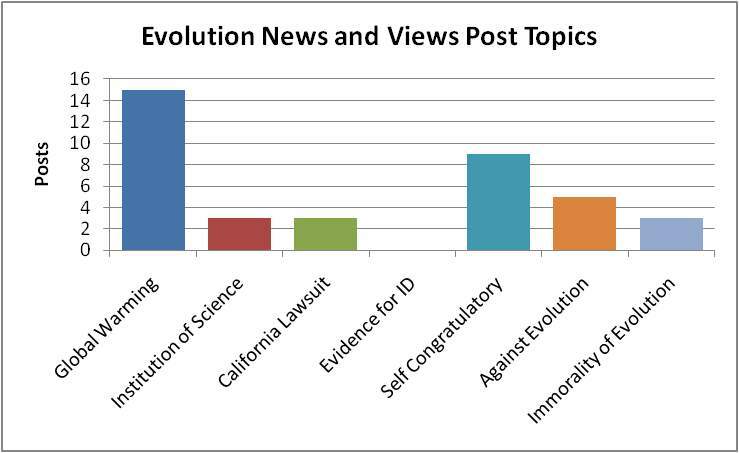 Objections by evolution deniers have been falling one by one, and this will hopefully continue that trend. The center will perform experiments on both live organisms and virtual organisms. This approach has several benefits and has been used in other areas of biology, especially neuroscience. Experiments performed by virtual organisms (simulations) can then be tested on live organisms to confirm their predictive strength. Likewise, experiments can be performed on live organisms and then be tested against virtual organisms. All and all, I think spending the money on this subject is valid. Many of the ideas learned from these experiments will have dual or multiuse applications. Not only will we learn about biology, but also about evolutionary actions of diseases, engineered projects, geologic phenomenon, etc. In reading some of the older posts from the Evolution News and Views blog, I came across a short post by Casey Luskin explaining that there is some wiggle room to what was and wasn’t designed in the Intelligent Design (ID) theory. Of course anyone with a cursory knowledge of ID would be aware that ID fully allows for the action of natural processes, and design is only invoked when we find tell-tale signs of intelligent action, such as high levels of complex and specified information. Intelligent Design more focused on politics than science? The chart is very telling on the state of affairs of the Intelligent Design (ID) movement. First, there is not one single post showing any evidence for ID. This shouldn’t come as a surprise, but it is always nice to point out. Second, most of the posts were focused on something that is not even related to evolution or ID: global warming. Together with the prevalence of the immorality of believing in evolution, I think it is clear that the ID movement is more political / philosophical than it is focused on science and the determination of reality. Just another reason why the whole idea is pseudoscience. The Discover website has a poll up where they want you to vote for the best video that explains evolution in 2 minutes or less. Some of them are pretty good. Go take a look.